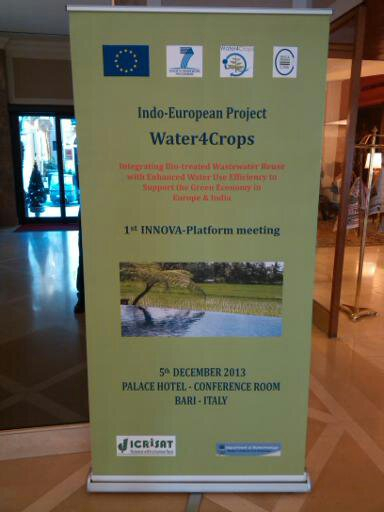 The first Water 4Crops INNOVA platform meeting took place on 5 December 2013 in Bari, Italy. The meeting brought together 35 experts in the field of wastewater treatment and water use efficiency from Italy, France, Germany, The Netherlands, United Kingdom, Greece and Belgium. These experts were challenged to explore business opportunities for the new technologies in the domains of waste water reuse and valorisation, and water use efficiency that are being developed in Water 4Crops project. The meeting facilitated discussions between researchers, potential users of the new technologies and marketing experts. Amongst the participants, experts from the AutoritàIdrica Pugliese (It), Acquedotto Pugliese (It), Sabmiller (India) and the Gesellschaft für Internationale Zusammenarbeit(GIZ, DE) represented different user groups. Marketing and business development specialists from LeAF (NL) and the Social Innovation Foundation (NL) also attended the meeting.